Getting some basic information on your customers is pretty easy with SimpleTexting right? You simply send them out a poll asking from some feedback, or you ask to take part in a Text-2-Vote campaign. These features are super easy and a nice quick way of getting some standard feedback from your customers. But what if you wanted a little but more than just some basic information? For example, what if you wanted to know the customers' zip code? Or what should the next pizza topping you add to your menu be? With the SimpleTexting multi-question survey you can do just that! 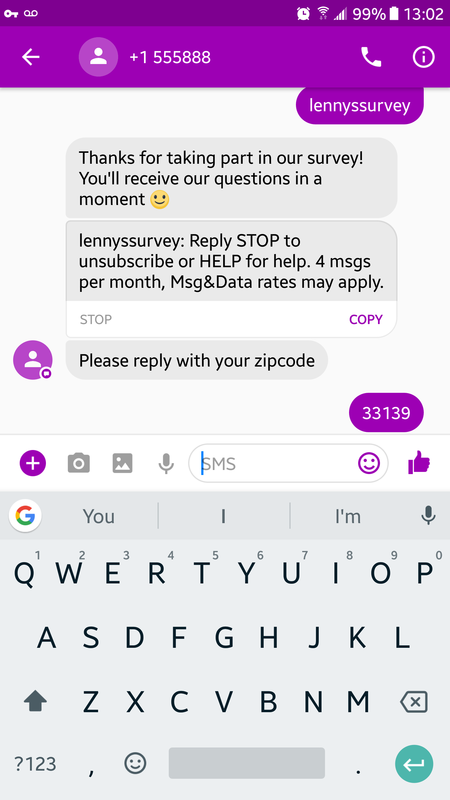 Let's take a look at how Lenny's Pizza solved this conundrum with SimpleTexting and Data Collection 🍕. Lenny's Pizza was looking for more information on their customers so they could target them with more relevant marketing. They wanted to know three things. What their zip code was, what their next topping addition should be and what they should offer as a side, let's walk through the steps they took to see how we could do the same! First, create a custom field for each question you want to ask on the survey. Go to the subscribers tab and select 'Custom Fields' in the top right. Next, select the custom field type you want to create. Choosing a type other than 'Text' will require the customer to reply with the correct format for the type selected. For example, it will ask for their zip code again if they reply with a 6 digit zip code. Below we made a new field for the zip code and the type of side and topping the customer would like. Now create a keyword for customers to text in to take part in your survey. Below we created a keyword called LennysSurvey with a message letting the customers know what to expect. Select the keyword you're looking to add the survey to. Finally, select the questions you would like to ask. You can edit the text to ask the question however you like, when you're ready click save 😁. To view the data collected, simply go to the Subscribers tab and click on the three dots to the right of the list you created and select "Export Contacts". You can check out the actual spreadsheet created from the survey here. Finally, you're going to want to get that survey out there! You can do so by creating a campaign. 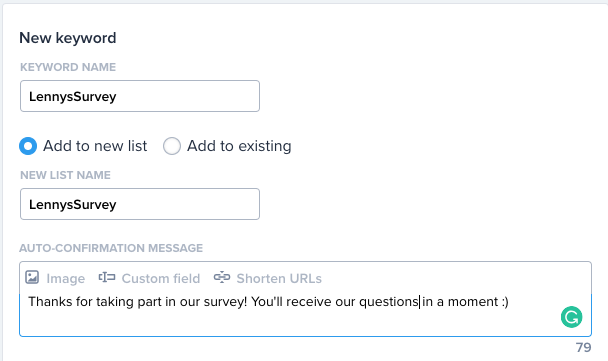 In the body of the campaign, encourage your users to reply back to the campaign with the keyword you created for the survey. You can also spread the word through social media, in-store signage, or word of mouth. Whatever you think works best for your audience. With that said, you'll probably see a higher response rate if you send it through SMS (Though we may be a bit biased 😛). Good luck with your survey, please let us know if you need some help with any of the steps we covered in this article 😁.